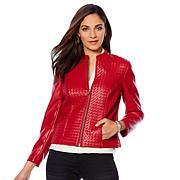 Get a haute look for the cold-weather season. 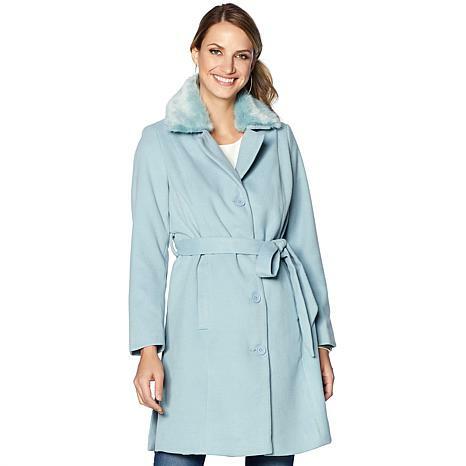 This warm, woven coat from Colleen Lopez features a removable faux fur collar so you can stay stylishly warm no matter where the day takes you. Based on Colleen,I sized up 1x but could have used XL.Great room on sleeves for my Angel Wing Arms. My RARA pin matches well with the upscale look of C.Lopez's design. Live in SoCAL deserts, so took the fir off. Used for business and casual, Received so many compliments. Wish I had ordered XL. Thinking now that I lost about 3 inches on tummy and hips with my Cubii by next cold season, coat will be too big. If that is case, will be donated to woman's shelter for Dress for Success closet. LOVE the pink color and the fabric is so soft and easy to care for. Love the faux fur collar. An Amazing Beauty of a coat! I wish I would have got this earlier in the season, so I could have worn it more. I got the Blush in XL & I sort of wish I would have gotten the 1X because it's snug in my curvy areas. I'm on a diet so I'm hoping next season it's a better fit for me. I will take off the fur because it's not the same size as the collar so it's awkward in my opinion. Love it otherwise. A great value for the price. I like that it has side slits instead of a back slit, just looks richer to me than a big slit.